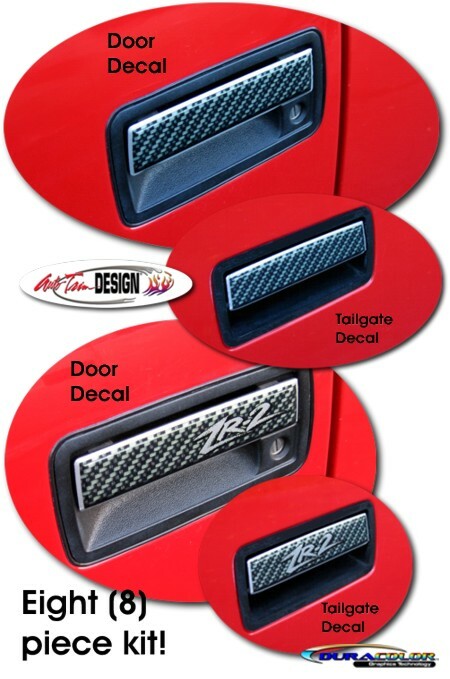 Detail your '94-Current Chevrolet/GMC S-10/Sonoma's door handles with these unique Simulated Carbon Fiber Door Handle Decals. Manufactured with our DuraCOLOR Graphics Technology, this three dimensional looking decal set will enhance the overall look of your ride. The simulated carbon fiber features a light Silver Metallic outline that enhances the look. This eight (8) piece kit comes complete with three (3) plain decals and three (3) "ZR2" type decals as shown in the picture. You can "Mix and Match"! Two (2) additional plain decals are provided for Blazer or Jimmy body style SUV rear doors. They are very easy to install and they look Great! Includes easy-to-follow online instructions. Get yours today!